Math concepts are fantastically weaved into all kinds of artwork and Cloud Gate in Chicago, IL is no exception! 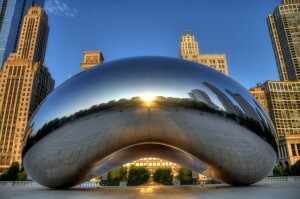 Cloud Gate is British artist Anish Kapoor‘s first public outdoor work installed in the United States. The 110-ton elliptical sculpture is forged of a seamless series of highly polished stainless steel plates, which reflect Chicago’s famous skyline and the clouds above. A 12-foot-high arch provides a “gate” to the concave chamber beneath the sculpture, inviting visitors to touch its mirror-like surface and see their image reflected back from a variety of perspectives. Inspired by liquid mercury, the sculpture is among the largest of its kind in the world, measuring 66-feet long by 33-feet high. Listen to the audio tour below. How can you spend your Math Minutes? Watch a video on how they “Clean the Bean” and post a comment about something new you learned. Ready about what’s inside the bean and look at several pictures of its construction. What math was involved in creating the bean? Suppose a regular bean was sitting next to Cloud Gate. What scale factor could be used to make the regular bean the size of Cloud Gate? Thanks to the Hoffart boys at Sunset for inspiring this Math Minute post! I learned that they clean the bean at midnight. I think they clean the bean at midnight because everyone is at the bean during the day and it would be hard to clean when every one keeps making fingerprints on it.